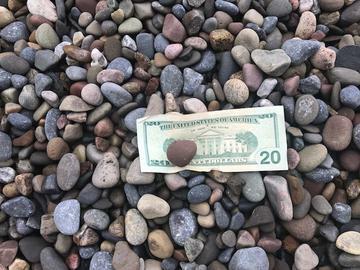 This is a good picture of the Adirondack River Stone after a good rain washing. Stone coloring seen in picture above, is when the Stone is dry. Stone picture below is when the stone is wet from rain. 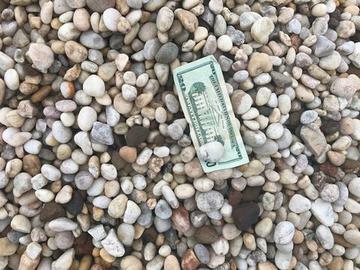 Vanilla Ice Rock - Is crushed into small stones the same coloring as rock above. A great accent for your driveway and gardens. White with sparkle and Gray tones is Massacussets granite. Wonderful for flowerbeds to bring out the brilliant, vibrant colors that our flowers naturally show. This natural stone comes in 1/2" and 3/4" in sizes. Skyview Stone also stocks this stone as large Vanilla Ice Rock. 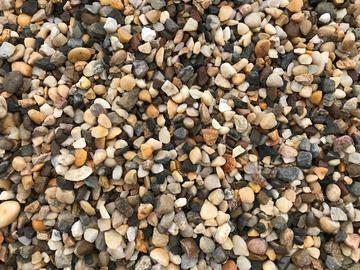 Long Island Stone - Crushed 3/4" size : Larger stone is crushed down to 3/4" size, giving product both round and crushed shapes. You can see the stone within varying the colors. Mountain Sunset Blend comes from the mountains of Pennsylvannia. At this time this product is currently unavailable. We have small size, which is a mixed size up to 2 inches. Also sometimes called Lava Rock or Timberlite. Product has multiple colors and is lighter in weight than other products it's size. 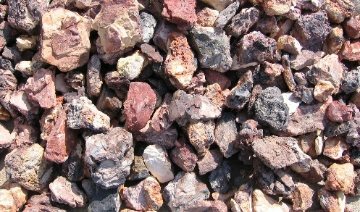 We also sell Mountain Sunset Blend in boulder size pieces up to 3 ft in size. Black Forest River Stone , is a natural small partially rounded stone, which is approximately 1/2" in size. This Stone is predominantly looking Charcoal Grey in color and darker when wet. Also available in 3/4"-1" size. 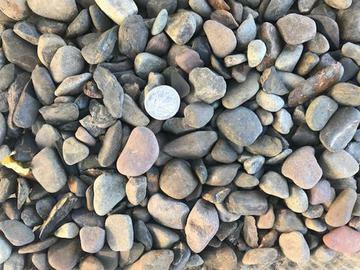 Black Forest River Stone Dry , 3/4" - 1"
Long Island Beach Pebbles : spreads out easily with a shovel and rake. Size in picture is 3/4". 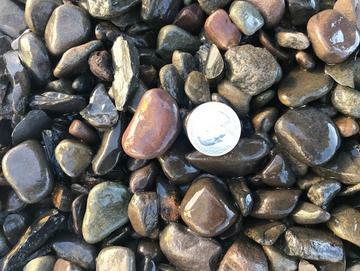 Adirondack River Stone Crushed comes in 1/2" +/-, and 3/4" - 1" size. Good for Landscaping, Waterfall Stone, Driveway Stone, Walkway Stone, Swimming Pool Stone, and Garden Stone. 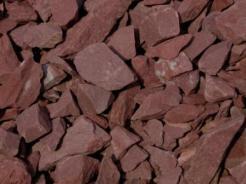 Pennsylvania Burgundy Stone is a vibrant deep red stone in color, great for accenting gardens and plant areas. Driveways with a slope use this 3/4" red stone as well, so the stone locks together and does not wash away as easily as smaller stone. Long Island Stone comes in a 1" to 4" mix size as well. As Decorative Landscaping Border Stone, or Stone Edging, this product is sold by the yard. 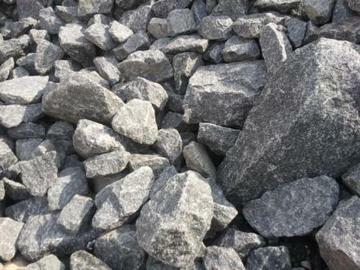 Jetty Stone, Gabion Stone, Wall Rock, Riprap comes in different sizes. Hi everybody ! I'm Clint, and I am 10 yrs old. 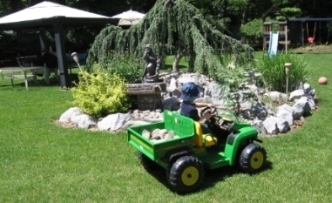 I drive and unload my own truck ( John Deere Gator ) with Catskill Mountain River Stone ! Come on down to Skyview Stone and pick out the right stone and rock for your house! How old was Noah when the Floods came ? How many days was the Earth covered with water ? DIFFERENT COLOR, SHAPE, and SIZE, ROCK FROM 9 DIFFERENT STATES, including LONG ISLAND BOULDERS.